Manners are universal. Every society throughout the world has a code of conduct by which standards are set for what is considered to be acceptable behaviour. Many will ask what the difference is between manners and etiquette. Etiquette is the science of social living which consists of rules and guidelines to help social interaction run smoothly. It helps us to know how to behave and what behaviour to expect from others. Manners are the behaviour we use to apply the rules of etiquette when interacting with others. Manners oil the wheels, so to speak. They are one of the most important ingredients for success in today’s global economy. Over the generations we have moved from roles to relationships. In today’s society, your behaviour and intelligence determine where and how far you will go in life. Soft skills and people skills are often more important than technical experience. Hiring, firings and promotions are often based on manners. Manners are the great equalizer because they are something everyone can possess. Research has shown children are most receptive to learning manners when taught at a young age. They are more apt to have better reading skills and overall academic success as a result. Furthermore, it is believed possessing good manners will help teens make better choices when they are faced with negative peer pressure. When children and teens understand and implement acceptable behaviour, it helps to control the incidences of bullying. The lessons children learn early will stay with them and become life skills just like reading, writing, and arithmetic. We are not born with these skills. Children have to be taught as well as shown how to be kind, courteous, and respectful of others so they can have smooth social interaction. In order for these skills to become part of them, they need to be put into practice regularly. Teaching manners is more challenging than teaching educational skills since children and teens tend to experience fundamental urges for discourteous conduct stemming from super charged egos. Often parents feel frustrated because they think they are not getting their messages across to their children or they are just not bothered for whatever reason. They shouldn’t get discouraged and give up trying. When you realise the fact that the future of civilization rests on the shoulders of children, only then do you realise how important lessons in manners are in order to live in society successfully. Manners are empowering and are an integral part of success. Having good manners helps an individual build confidence, increase self esteem, and improve communication skills. Etiquette and good manners help people make friends more easily and create positive impressions on others. We only have one chance to make a first impression. Manners provide an extra edge that will make the difference between you and the other person. Etiquette and protocol provide the guidelines for individuals to manage social and business environments effectively. Equally important, manners create civility which helps people resolve conflict and confrontation without aggression. Practicing good manners earns respect as well as demonstrates self respect. When we feel confident in social situations, we are able to relax, put our best foot forward and enjoy ourselves. 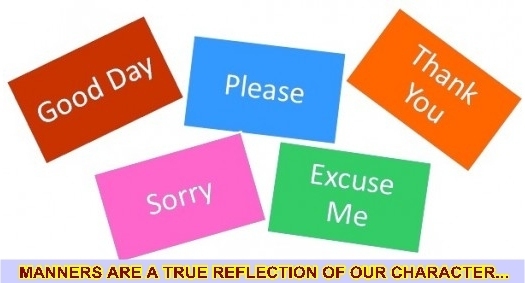 Good manners have shifted over the past generations from “caring for others” to “pleasing ourselves.” With pleasing ourselves comes a loss of respect for one another, and consequently, incivility is a growing problem. There are many theories about how we got to this point. Some feel the social changes of the 1960s and 1970s have been an important factor in redefining the old norms and changing social codes. Experts believe the parents of that generation were so busy adjusting to their new roles, teaching common courtesies to their children got pushed by the wayside. We’ve become a society who’s distrustful of social rules because we think they will bring back the old gender roles. Also, we did away with the rules that weren’t fair, the rules that didn’t treat people as equals, and in the process some of the good went out with the bad. Today, many place the blame on parenting skills. Sociologists claim we make children think they’re invincible through what psychologists call “cheap self-esteem,” and give them a sense of entitlement that has helped to create a narcissistic and egocentric population. In recent years we have witnessed a change in the work place where employers have relaxed the rules in an attempt to adopt to our ever increasing casual lifestyles. This has played a part in our having relaxed attitudes towards protocol and etiquette. Enter into the mix the influence of television with its poor role models and inappropriate social nuances. Adding insult to injury, the Internet has come along and allows us to say whatever we want whenever we want without taking responsibility for our words. Electronic communication has helped to diminish our ability to effectively communicate face to face. All too often the lack of good communication and social skills results in unresolved anger and a lashing out. Some people may not understand the relevance of etiquette and manners training. They may think the notions of protocol and civility are quaint and out dated concepts. Many also believe manners are only for the elite, the privileged or the country club set. The good news about manners and etiquette is that they are not just for the “manor born.” Etiquette is for everyone who wishes to improve themselves and make a difference in the world. Manners cost little and pay big dividends. Lady Mary Wortley Montagu once said, “Civility costs nothing and buys everything.” Her words remain true even today. Good manners still open doors. We all have a responsibility to be civil and treat each other well. On the other hand, you may feel embarrassed or intimidated that you do not know all of the “rules.” This should not become a stumbling block for not trying to learn. Many people work on mastering their skills throughout a lifetime. Everyone has room to grow and there is no time like the present to brush up and polish your skills. GOOD MANNERS ARE WHAT MAKE LIFE EASIER AND MORE PLEASANT. IF SOMEONE OPENS A DOOR FOR YOU, YOU WILL SAY “THANKS”. IF YOU WITNESS A PERSON STRUGGLING YOU WILL ASK HIM IF THE PERSON NEEDS A HAND AND HELP HIM. AFTER ALL, WE SHARE THIS PLANET. THUS, IT IS ONLY APPROPRIATE THAT WE SHARED SOME SIMPLE APPROACHES TO LIVING ON IT THAT BENEFIT US & AS MANY PEOPLE AS POSSIBLE.